The cost of sending one and two-year-olds to nursery may have to increase substantially when free childcare for older children doubles, charities warn. Free care for three-and four-year-olds is to rise from 15 to 30 hours in each term-time week under government plans. But the Pre-School Learning Alliance said fees were likely to rise elsewhere to cover the shortfall as not enough funding was being provided. 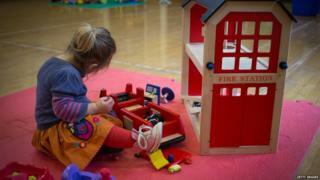 The government said it was investing £6bn in childcare in this parliament. Pilot schemes are due to begin in the autumn, with the full scheme implemented across England in 2017. Childcare providers have told the Victoria Derbyshire programme they are only currently managing to offer 15 hours of free childcare a week by plugging a shortfall in government funding, usually by asking parents to pay a higher rate for the additional time the child spends in nursery. But they say the amount of money the government is offering to enlarge the scheme will not cover their costs and the increase would make it more difficult to cross-subsidise places in this way - so they may need to increase fees of younger children who are not included in the plans. Pre-School Learning Alliance, which represents 14,000 childcare workers, says it has "grave concerns" over funding and fees for under-twos could rise "substantially". Its chief executive, Neil Leitch, said: "You don't need to be an accountant to work out that if you extend those 15 hours to 30 hours, you have a problem because you don't have the ability to cross-subsidise the fees. Education and childcare minister, Sam Gyimah, said: "This does not match what we're seeing on the ground and many providers want to work with us to trial our 30-hour free offer. "We will be investing £6bn per year in childcare by the end of this Parliament so that we can offer hardworking families the affordable childcare they need." In Wales, all three and four-year-olds are entitled to a minimum of 10 hours of free foundation phase early education, while in Scotland they are eligible for 600 hours of free childcare a year (the equivalent of around 16 hours a week during term time). In Northern Ireland, under the pre-school education programme, there is an allocation of funded places for children in the year before they start school.